Tea Ceremony: Explore the unique Japanese tradition of sharing tea is an exciting and fun way to introduce Asian culture to kids. 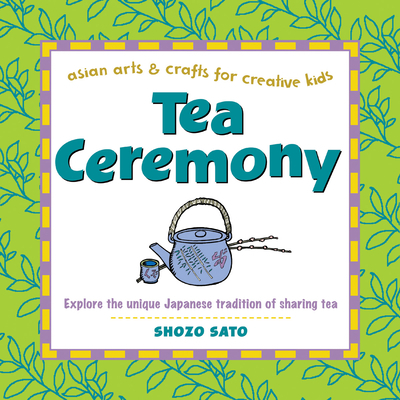 Readers will learn all the steps for performing a traditional Japanese tea ceremony. The Asian Arts & Crafts for Creative Kids series is the first series, aimed at readers ages 7-12, that provides a fun and educational introduction to Asian culture and art. Through hands-on projects, readers will explore each art--engaging in activities to gain a better understanding of each form. Shozo Sato is a master of traditional Zen arts, and has received the Order of Sacred Treasure from the Emperor of Japan for his contributions in teaching Japanese traditions. His areas of expertise include ikebana (flower arranging), chanoyu (tea ceremony), and Japanese theater as well as sumi-e (ink painting). He conducts workshops on ikebana and sumi-e throughout the U.S., Asia and Europe and is the author of numerous books including Tea Ceremony, Shodo: The Quiet Art of Japanese Zen Calligraphy and The Art of Sumi-e. He was the founding director of Japan House at the University of Illinois, where he is Professor Emeritus and continues to teach Japanese arts. Shozo Sato resides in Champaign, IL.